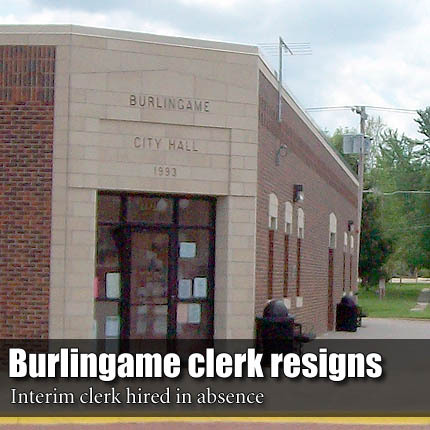 BURLINGAME—The Burlingame City Council accepted the resignation of Burlingame City Clerk Patti Gilbert, effective May 8. The council action occurred during its May 6 meeting, following conclusion of an executive session to discuss non-elected personnel. The session was extended one time. Twelve days earlier, after extending an executive session nine times to discuss non-elected personnel, the council suspended Gilbert with pay for a two-week period, effective on the date of a special meeting, April 24. Gilbert had been employed by the City of Burlingame for approximately eight years. The council convened a second executive session, requesting presence of Burlingame Utility Clerk Janene Fry, to discuss non-elected personnel. The executive session was extended one time, with requested presence of Fry and Burlingame City Attorney Rick Godderz. Following conclusion of the extension, the council adopted a motion by Burlingame City Council Member Carolyn Lee, seconded by Burlingame City Council Member Vikki DeMars. The motion called for employing Fry, effective immediately, as interim city clerk, to be compensated at the rate of $14 per hour for the duration of employment in that capacity. The council convened a third executive session, requesting presence of Cindy Harris, to discuss non-elected personnel. The executive session was extended one time, with continued presence of Harris. Following conclusion of the extension, the council adopted a motion by Lee, seconded by DeMars, to employ Harris as manager of the Burlingame swimming pool for the upcoming season. Adoption of the motion included ratification of pool fees and operating hours, as recommended by Harris. The council received a request from Amber Moon on financial support of activities associated with Rodeo Days, May 17 and 18. The weekend will feature the 43rd Annual Santa Fe Trail Rodeo, presented by the Burlingame Saddle Club. A motion, which authorized expenditure of $745.26, including $150 match for an Osage County grant to support out-of-county advertising for the event, was adopted. By consensus, the council affirmed Moon’s plan to retain profits as seed money for support of future Rodeo Days and County Christmas festivities. Burlingame Mayor Mike Dorr agreed that the city should not be obligated to provide continuing support for those events. The council adopted a motion establishing annual official appointments, as required by statute, including: official depository of city funds, Bank of Burlingame; official city newspaper, The Osage County Herald-Chronicle; city attorney, Rick Godderz; and city municipal judge, Sue Devoe. Burlingame Chief of Police Jon Shaffer recommended mayoral and council member attendance at the Incident Command System Seminar May 23, hosted by Osage County Emergency Management, at the Lyndon Community Center, 204 Topeka Ave., Lyndon. Afternoon and evening sessions are scheduled, starting at 2:30 p.m. and 7 p.m., respectively. The purpose of the seminar is to familiarize city, county and school board elected officials and city, county and school administrators with operation of the incident command system during natural and human caused emergencies and disasters.